the construction of an art museum on the University of Florida campus. At the time, the gift was the largest private gift ever given to the University. Then University of Florida President Marshall Criser and Provost Robert A. Bryan gave the project enthusiastic support. With the assistance of State Representative Jon Mills, state matching funds were secured in order to move forward with design and construction. 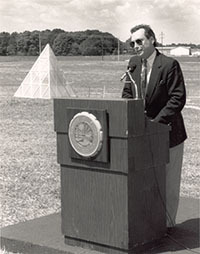 At a critical time in the project, Dr. E. T. York, a former chancellor of the State University System of Florida and University of Florida Distinguished Service Professor Emeritus, led a successful fundraising effort to secure additional resources needed for completion of the state-of-the-art museum building. With contributions from three generations of the Cofrin and Harn families, donations from other individuals, and matching funds from the State of Florida, the $8.7-million project moved forward to completion. 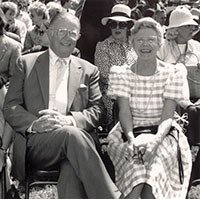 The founding donors elected to name the new museum for Mary Ann Harn Cofrin’s father, Samuel P. Harn, a beloved Gainesville businessman and civic leader. Prior to becoming the Director of the Harn, Budd Bishop was the Director of the Hunter Museum of Art in Chattanooga, Tennessee and the Columbus Museum of Art in Ohio. Community and university leaders gathered to celebrate the groundbreaking of the 64,470-square-foot Harn Museum of Art. Trained volunteer tour guides were selected to introduce the museum's exhibitions to visitors. Motivated by a love for art and education, docents continue to be instrumental in providing tours to visitor of all ages. Since 1989, more than 175 volunteers have served as docents. On September 22, 1990 the Harn opened with a permanent collection totalling almost 3,000 objects, of which more than 2,000 objects were accessioned from the University Gallery. The Museum’s inaugural exhibitions included loan exhibitions of Old Master European paintings, contemporary Latin American paintings, Florida landscapes by the 19th-century painter Herman Herzog lent by Dr. and Mrs. David A. Cofrin and Alexander Calder’s monumental sculpture Red Dragon lent by Irma and Norman Braman. Installations from the permanent collections featured American art from the 19th and 20th centuries and sculpture from West Africa and Papua New Guinea. The Robert H. and Kathleen M. Axline Acquisition Endowment was established for Asian art acquisitions. This exhibition, organized by the Harn and on view from July 12, 1991 - September 8, 1991, was the first to travel to another venue after its exhibition at the Harn. The staff trained 12 graduate and undergraduate students from the University of Florida in the first year of the program providing professional experience and guidance. Interns have worked in areas such as curatorial, finance, fundraising, operations, marketing, landscaping and visitor services. To date, the Harn has provided more than 250 internship experiences. This endowment was established for unrestricted art acquisitions. 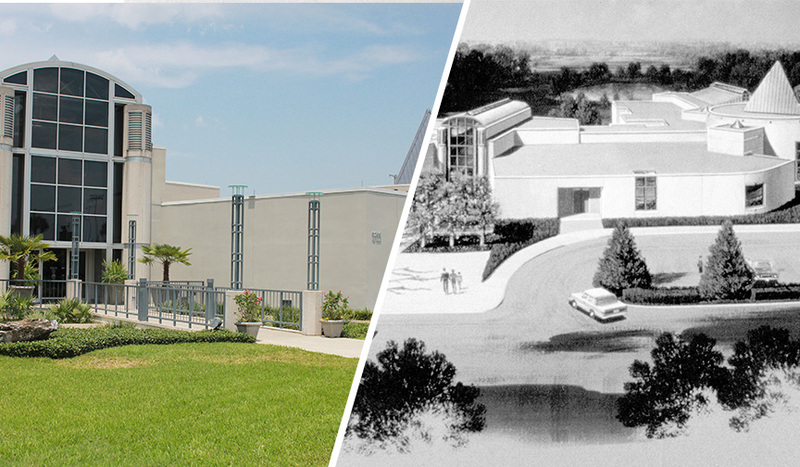 Joining the Harn Museum to make up what is now known as the UF Cultural Plaza, the Phillips Center for the Performing Arts opened its 1,700-seat theatre with three sold-out performances of CATS. This endowment was established for program support. The Committee on the Collections serves as witness on behalf of the University to the actions and decisions taken by the Harn relating to its art collections. The primary goals of the committee are to guide the Harn’s policies regarding collections and to assist the Museum in executing its mission to build and maintain exemplary collections that will advance teaching and research at the University of Florida. This program enhances collaboration between the Harn Museum and the UF School of Art + Art History. The first Eminent Scholar, Dr. Roy Siebert, a Professor of Fine Arts from Indiana University and a Research Scholar Emeritus from the National Museum of African Art, taught a graduate seminar that resulted in a student-curated exhibition at the Harn. Written by Dr. Robin Poynor, Associate Professor in the UF School of Art + Art History, “African Art at the Harn Museum: Spirit Eyes, Human Hands” was published by the University Press of Florida. An exhibition by the same name was displayed the next year. This Harn original exhibition was on view from January 7, 1996 to January 11, 1998. This exhibiton travelled to other venues after its exhibition at the Harn. MOSAIC, now known as the Bishop Study Center, was made possible through funding from the Jesse Ball Dupont Foundation. MOSAIC displayed study exhibitions, scholarly publications and hands-on resources complementing art on view in the Harn's galleries. Profits from the Museum Store benefit programs and exhibitions at the Harn. Museum store square footage was doubled to provide more space to sell work by local artists, jewelry, books and merchandise related to exhibitions and collections. This endowment was established for the support of MOSAIC, now known as the Bishop Study Center. This endowment was established for the support of educational programs. The Bishop Study Center, named in honor of the Harn’s founding Director Budd Bishop and his wife Julia Bishop, continues to serve visitors and enhance the museum experience. This endowment was established for support of exhibitions and programs. The Harn earned accreditation from the American Association of Museums, the highest national award a museum can receive. This accreditation requires that, to best serve their communities, museums must be committed to institutional improvement and maintenance of the highest standards in collections stewardship, governance, institutional planning and education and interpretation. In 2007, the Museum was successfully reaccredited which takes place every 10 to 15 years. This endowment was established to support one internship at the Harn per year by a University of Florida graduate or undergraduate senior. Eligible students can major in any field of academic preparation and can serve any department at the museum. This endowment was established by multiple donors for the support of exhibitions and programs. Organized by the Harn, this exhibition was on display from December 14, 1997 – May 17, 1998. A catalogue accompanied the exhibition. 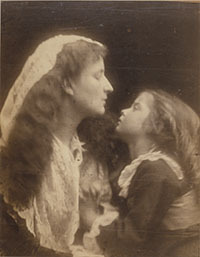 This endowment was established for photography acquisitions. Completing what is known as the University of Florida Cultural Plaza, the 55,000-square-foot education and exhibition center is dedicated to undertaking scientific research, building collections, establishing and maintaining a repository, developing exhibitions and conducting interpretive programs. This exhibition was on display from March 22, 1998 – March 1, 1999. A catalogue accompanied the exhibition. During his career, he was awarded distinguished service recognitions by three museum professional associations. Bishop now lives with his wife Julia and works as a painter and art consultant in Livingston, Tennessee, and serves on the Tennessee Arts Commission. This endowment, which shifted to the Wachovia Foundation Museum Technology Endowment and later the Wells Fargo Museum Technology Endowment, was established to support the use of technology to enhance teaching, research and programs. Persistent Memory: The Architecture of Time in Video Art featured work by William Kentridge, Bill Viola, Stan Douglas, Marina Abramovic and Sylvie Bloucher, and was on display from January 21 – December 17, 2000. This exhibition featured works by Martin Johnson Heade, Winslow Homer, Thomas Moran, Sergio Vega and Robert Rauschenberg, and was accompanied by a catalogue. The Swamp: On the Edge of Eden was on display from September 29, 2000 – January 7, 2001. This endowment was established for art acquisitions. This endowment was established for exhibition and program support. The Neilson Internship is awarded once a year to a graduate student earning a Master of Arts degree or certificate in museum studies. This intern assists the Museum’s Registration department. The Harn encourages families with children to connect with art on view by participating in a family-friendly tour and art activities. This endowment was established to support art acquisitions. This workshop, which is now held annually, offers Florida educators the opportunity to investigate visual art, work with regional artists and conceptualize authentic classroom connections to use with their students. This program allows local teachers and university professors to borrow educational materials from the Bishop Study Center for use in the classroom. Prior to her appointment Nagy spent 17 years at the North Carolina Museum of Art in Raleigh, where she concluded her tenure as Associate Director of Education while also serving as Curator of African Art. From 1988 to 2002, she also served as an Adjunct Faculty member at UNC in Chapel Hill. This addition was planned to add more contemporary art exhibition space, classrooms and a café. It was funded by a generous gift from David and Mary Ann Cofrin. Funded by a grant from the MetLife Foundation this program involves specially trained Docents bringing large posters, hands-on objects, music and photographs into retirement residences and group facilities to engage senior audiences. The goal is to enrich the lives of seniors through arts programming while encouraging the use of art as a catalyst for interactions among senior residence, facilitators and staff. This endowment was established to support exhibition collaborations between Harn curators and UF faculty. This program brings children ages 2 - 5 and their guardians together to learn about art. Participants tour Harn galleries, create art and explore age-appropriate concepts. Since 2003, more than 6,125 visitors have participated in Tot Time. (devotional wood sculptures of saints and holy figures). The exhibition featured 60 Puerto Rican Santos, by 22 contemporary artists, drawn from the local collections of Héctor Puig and Tricia Sample. Santos was on display from October 28, 2003 – February 22, 2004. The exhibition was accompanied by a catalogue. This exhibition featured documentary photographers capturing life in cities from New York to San Francisco from the 1930s to 50s. This exhibition was on view from December 16, 2003 - February 8, 2004. This endowment was established with proceeds from the Party on the Plaza Fundraiser which benefited all members of the UF Cultural Plaza. This program, established through funding by UF Student Government, is designed especially for college students while also engaging the local community. The program continues today and is still supported by Student Government, as well as the Office of the Provost. Other campus groups provide additional funding on certian nights. These campus groups include Engineering, Center for European Studies, Center for African Studies and the Asian American Student Union. This exhibition was on view from May 18, 2004 - August 22, 2004. Drawn from a private Florida collection, the more than 50 photographs revealed Adams' lasting engagement with nature and his rich contribution to the history of American photography. This original Harn exhibition was on view from March 9, 2004 to July 18, 2004. The exhibition travelled to other venues after its exhibition at the Harn. by the Caroline Julier and James G. Richardson Art Acquisition Fund. This endowment was established to support lectures. For the past 11 years, during the holiday season, the Harn has moved a portion of its store to UF Health Shands Hospital for a one-day sale. Proceeds from the sale benefit UF Center for Arts in Medicine as well as programs and exhibitions at the Harn. The MUSE program offers the opportunity for university students to share their love of art with others. MUSEs are one-semester project volunteers who create and present interactive, engaging experiences for museum visitors. 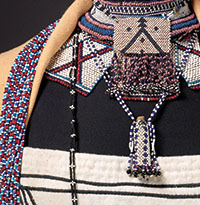 twice each year, connecting the Museum’s collections and exhibitions with University curriculum. This group, comprised of key individuals in the University and community, is made up of members of the school board, staff from the public library, UF and Santa Fe College professors and students, and local art educators and artists. Its members are important ambassadors for the Harn’s education department, providing feedback and ideas for future programming. Hammering Man, a gift from Martin Z. Margulies, was installed beside the Harn's front entrance. This work is one of several site specific versions located all over the world from Los Angeles, Seattle, Basel and Frankfurt. The 18,000-square-foot space opened to the public adding 6,500-square-feet of exhibition space, two classrooms and the Camellia Court Café. This endowment was established to support educational programs related to the Museum Docent Program. This endowment was established to support scholarly publications at the museum. This exhibition of works ranging from early daguerreotypes of the 1840s to today’s digital and electronic images, is drawn from the Harn Museum of Art and generous loans from eight Florida collections. This selection highlights different characteristics of photographs as collectible objects and surveys the medium’s processes and uses over more than 150 years. This exhibition was on view from March 7, 2006 - May 28, 2006. This exhibition examined seven major categories of Qing-dynasty jades: functional bowls, decorative jades, archaistic jades, representational jades, symbolic jades, jade boulder and Mughal-style jades. 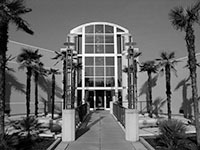 Organized by the Harn, the exhibition was on display from September 5, 2006 – January 28, 2007. A catalogue accompanied the exhibition. This endowment was established to support educational programs. This endowment was established by David and Mary Ann Cofrin in honor of Mrs. Cofrin’s sister and to support art acquisitions. On display from January 23 – April 29, 2007, this exhibition told the story of modern and contemporary Ethiopia from the 1940s to the present and explored the role of government support of artists as part of a purposeful strategy for modernization of Ethiopia. Continuity and Change was organized by the Harn and North Carolina Central University Professor Achamyeleh Debela; a catalogue accompanied the exhibition. This exhibition travelled after its exhibition at the Harn. The Harn and Florida Museum of Natural History continue to offer activities for families with children around Earth Day each April. This exhibition encompassed the full scope of contemporary Cuban art history beginning with the crucial period of the early 1980s, which saw a resurgence in artistic production and political discourse that marked the birth of “New Cuban Art.” The exhibition consisted of 58 artworks created primarily during the 1990s and early 2000s by 40 Cuban-born artists. The exhibition was accompanied by a 188-page bi-lingual (English and Spanish) book. Dr. and Mrs. David A. Cofrin pledged a gift of $10 million to fund a 26,000-square-foot addition dedicated to the conservation, exhibition and study of Asian art. The gift included two Asian gardens and art storage space. This exhibition of 100 paintings, sculpture and drawings by 75 internationally renowned 20th and 21st century artists was drawn from the Florida collection of Carol and Stephen Shey. It was on display from February 10 – May 18, 2008. The exhibition was organized by the Harn and was accompanied by catalogue. Founded by Jason Steuber, Cofrin Curator of Asian Art and funded by the AEC Trust in honor of Dr. Cofrin's dedication to Asian art at the Harn. This volunteer program was created to assist in offering information and assistance to Harn visitors. This endowment was established to support docent programming. This endowment was established to support the acquisition of American Art. The UF School of Art and Art History and the Harn hosted an international symposium February 20 - 21, 2009 relating to the varied and yet interconnected topics of collecting Chinese art and how the dynamic of collecting and exhibiting Chinese art has unfolded over the past centuries. Funded by the Harn Eminent Scholar Program at the University of Florida’s School of Art and Art History (HESCAH). Construction of the 26,000-square-foot addition began on the northwest side of the museum. Plans included three levels featuring 6,000 square feet of Asian art gallery space, an upper level for curatorial and museum activities, art storage and conservation space for the Asian collections and two Asian gardens. 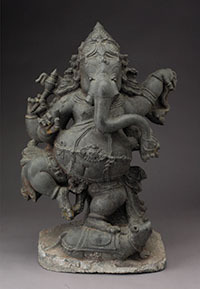 Dr. Cofrin bequeathed funds to support Asian art acquisitions. The Harn holds a series of weekly art camps each summer. Camps include gallery explorations and art-making that connects with Harn collections and exhibitions. This catalogue features more than 90 works by American artists in the Museum’s modern and contemporary art collections and photography collections. Every five years, the Harn Museum of Art displays work by UF’s School of Art + Art History (SA+AH) Art Studio Faculty working in a wide range of media including painting, ceramics, mixed-media and video display. The exhibition was open from October 6, 2009 – January 3, 2010. For the 20th anniversary year of the fall of the Berlin Wall, artists in the exhibition questioned the promise and potential of Europe’s democratic dream. The works featured in this exhibition, which included large-scale wall paintings, photography and video by 20 artists from Turkey to the British Isles, explored the complex and subtle relationship between art and politics. The exhibition was open from February 7 – May 9, 2010. The exhibition was accompanied by a catalogue and travelled to another venue after its exhibition at the Harn. This exhibition featured about 50 graphic works related to labor issues and demographics, popular culture, immigration trends and national identity during the first half of the 20th century. This exhibition was open from June 8, 2010 - September 5, 2010. The museum's first overall collection catalogue offers 50 highlights from the museum's five major collecting areas--African art, Asian art, contemporary art, modern art, and photography--as well as selections from its ancient American and Oceanic collections. This volume also offers exclusive, behind-the-scenes information about registration, education, development, marketing, public relations and community engagement. Featuring more than 40 textiles, garments and other works of art, this exhibition illustrated the aesthetic power and rich cultural histories of textiles produced across the continent of Africa. The exhibition was open from February 8, 2011 - May 8, 2011. This exhibition was accompanied by a catalogue and travelled to another venue after its exhibition at the Harn.